We invite you to explore India - the Land with infinite beauty ! Whether you soar high into Himalayas or peer under the ruins of the Ancient monuments dotting the landscape of India, you will cherish the experience long after your visit ! This India Travel Guide on Tirupati temple is free from any commercial interest! This site is dedicated to promote India - the vast subcontinent, its glorious past, magnificent landscape and its infinite variety. Steadfast devotees stand for hours together at Tirupati to have a glance of the presiding deity Lord Venkateswara. Tirupati reportedly attracts the largest number of pilgrims for any shrine in India. Situated in a town of the same name, Tirupati in Andhra Pradesh, this is considered as one of the most sacred and richest temples in the world. It is managed by Tirumala Tirupati Devasthanam (TTD). The word Tirupati means 'Lord of Lakshmi', which is appropriately applied to the village on the Venkata hill, which is the abode of the God Venkateshwara Perumal. Located about 67 km from Chittoor in Southern Andhra Pradesh, this temple is a crown in the jewel in the crown of places of worship in Southern India. The ancient and famous shrine of Lord Venkateswara, adorns the seven hills. 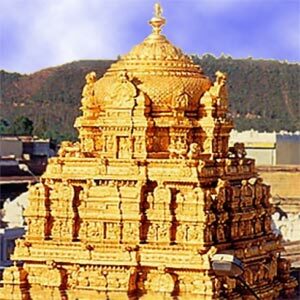 The temple is located on the Tirumala hills. This conglomeration of seven hills is known as Seshachalam and Venkatachalam. It is 2800 ft above sea level. A vibrant and colourful legend is told about this temple and it's deity. Ancient Tamil Sangam literature like Silapadikaram talks of this temple built by the Tamil Pallava king Thondaiman inspired by a dream about Vishnu - the God of Preservation in the Hindu Pantheon. In the year 614 AD, the Pallava Queen Samavai Perun Devi adorned the deity with silver offerings which initiated the royal patronage of this temple town. Later Chola kings, despite being ardent Shaivates (devotees of Shiva) continued the patronage to this Vaishnavaite shrine. It was Ramanuja, the Vaishnavite saint born in the 11th century AD who climbed the seven hills. Venkateswara appeared before him and blessed him. The Tirumala Tirupati hills are called Sheshnag, after the cosmic serpent and Sapthagiri, or seven hills. The temple of Lord Venkateswara is located on the seventh peak, Venkatadri. Tirupati or Thirupathi as is variously known represents 'The Lord' in Tamil. It is a compound word made out of 'Thiru' and 'pathi' in Tamil. The seven hills called as 'Saptha Giri' represent the legendary seven rishis (Ascetics) - Saptharishi. They are Venkatadri - the hill of Venkateshwara or Srinivasa ( meaning where the Shakti lives) , Narayanadri - the hill of Narayana - another name for Vishnu, Virushabadri, the hill of the Bull, Anjanadri, the hill of Anjaneyar, Garudadri, the hill of Garuda - the Eagle, Seshadri , the hill of Vishnu and Neeladri , the hill of Neela Devi. During the period of Vijayanagara dynasty in the 15th century AD, the temple gained much recognition. Credit goes to Krishna Deva Raya who donated gold and other ornaments to the temple and constructed extended shrines. Mahants and Hatriamji Mutt looked after the temple from 1843 to 1933 AD. Dravidian style of architecture is followed in the temple. The Vimana 'Ananda Nilayam' is placed over the sanctum sanctorum which is completely gold plated. The temple has three prakarams - the outermost enclosure has the Dhvajasthambha or the banner post. Statues of Vijayanagara King, Krishnadevaraya and his spouse and the idol of Todarmal, minister of Akbar are some other highlights in Tirupati. The image of the temple deity is a representation of both Lord Vishnu and Lord Shiva. While Lord Vishnu is the preserver, Lord Shiva is the destroyer. Tirupati is the richest temple in India and there are incidents where devotees drop diamonds at the feet of the Lord. Lord Venkateswara awakens with 'suprabhatam' as early as three in the morning. He sleeps around 1 o'clock midnight, after the 'Ekanta Seva' is performed. 'Sevas' and 'Utsavams' of the Lord are performed daily, weekly and periodically. The donations and gifts offered at the 'Hundi' is one of the main sources of income at Tirupati. The annual 'Brahmotsavam' is performed at the temple for about nine days in the month of September every year. The 'Garudostavam' and 'Rathotavam' take place on the fifth and sixth day of the festival. References in ancient Tamil literatures like Tolkappiam and Silappadikaram stand testimony to the ancient ancestry of this temple. Tamil saints Poigai Alwar, Bhuthathu alwar have sung poems in praise of this Lord. Ancient puranas draw reference to this temple. Tirupati is one of the 108 Sri Vaishnavite Divya Desams of the Vaishnavite tradition. At Tirupati, Anna Prasadams -' pulihora', 'chitrannam', sweet pongal and curd rice are all distributed free of cost to the pilgrims coming out after darshan. 'Laddus' are sold to the pilgrims in the counter outside the temple. Every day about 70,000 devotees visit this temple and on special days this figure can easily be doubled. So to make the viewing (darshan) of the presiding Deity - Venkateshwara, the thirumala devasthanam (TTD) has made elaborate arrangements. The free darshan (Darma Darshan) costs you nothing - but makes you wait for up to 12 hours in a serpentine queue. Faster Darshan - Shikra Darshan - costs you about Rs.300/- which will take only a couple of hours to view the Lord. You can book your Special Darshan in any TTD offices. The darshan or the view lasts less than a minute in any case. The nearest airport is Renigunta which is about 15 kms from Tirupati. An auto or taxi can be taken to reach the temple from here. Tirupati is well connected by railways. This place is also connected by rail with Hyderabad, Chennai, Kolhapur, Mumbai, Puri, Tiruchi, Varanasi, and Vijayawada. Tirupati is linked with important cities like Hyderabad, Bangalore, Chennai, Vijayawada and Lepakshi through a network of roads.